A mountain is a mountain is but a mountain – unless it is Table Mountain of course. Recently voted one of the seven natural wonders of the world, Table Mountain is the perfect backdrop to the tourist city of Cape Town. Below we provide essential Table Mountain Information for those who are looking forward to be visiting this natural wonder. Thousands flock to the top of Table Mountain each year to enjoy the natural beauty and awesome views. Cape Town is arguably one of the world’s most attractive and most popular tourist destinations. 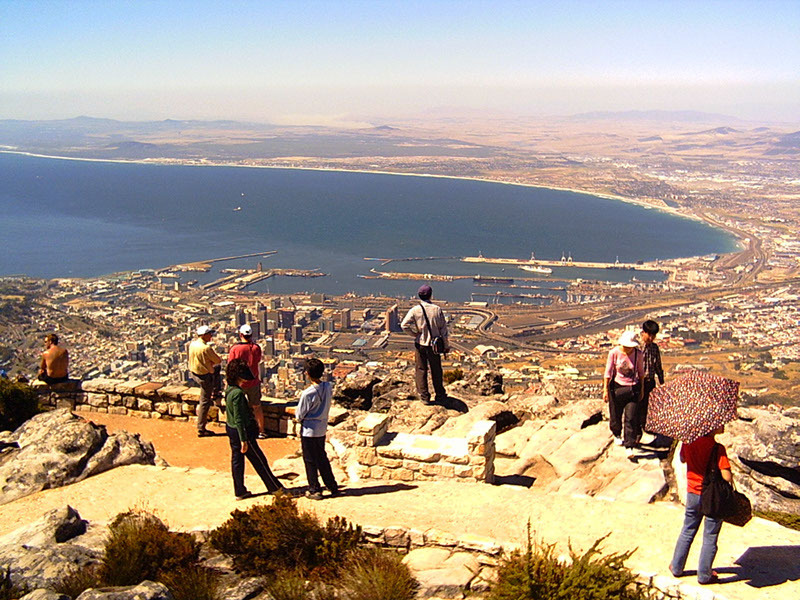 The Table Mountain experience is certainly a must on the Cape Town tourist’s itinerary. Table Mountain is located in the Cape Floral Region Protected Area, a UNESCO World heritage site and forms an important part of South African National Parks’ extensive protected nature areas. Millions of people have climbed the slopes of Table Mountain. The view over Cape Town, Table Bay, Robben Island, Lions Head and the expanses of the Atlantic seaboard is certainly worth the effort. At the time of this writing over 24 million people have opted instead to take the famous Table Mountain Aerial cableway to the top of this notable landmark. * Note that the cableway will be closed between 27 July and 9 August 2015 for annual maintenance. Table Mountain offers hundreds of hiking and climbing routes, all with nuances of natural and scenic beauty that rival most of the top locations around the globe. With a unique combination of flowering fynbos, proteas and interesting mammals such as the Cape Rock Hyrax, or Dassie. The Rock Hyrax is a furry rodent sized critter which surprisingly, shares a common evolutionary ancestor with the Elephant and the Sea Cow, or Manatee. Most of Table Mountain’s hikes are accessible during all seasons and many information and map sources are available for navigating the popular routes. Many routes can be treacherous though and unless you are very experienced it is advisable to join a guided group instead of going it alone. Rock climbers and free-climbers also rate Table Mountain with its wide range of difficulty grades as a must on the bucket list. Lions Head, which looks down on Bayview House, is a very popular climbing option as it can easily be enjoyed during a half day excursion. The route is generally accessible to young and old of moderate fitness with just a few chain assisted inclines along the way. A slightly longer, alternative route, also offers the option to bypass the chain assisted climbing sections. From the top of Lions Head one can enjoy unsurpassed 360 degree views of Cape Town City, Table Mountain, Robben Island and Table Bay. Lions Head is also famous for the night hikes organised during full moon and other brightly moonlit dates. Bayview House, the renowned guest house, is of course located practically in the shadow of Lions Head and Table Mountain. Bayview’s guests can take advantage of its prime location, by hiking from the guest house, or take a few minutes’ transport to get to the start of the top hiking trails nearby. Christine, the owner will be glad to provide visitors with additional Table Mountain Information and offer insights into a myriad of Cape Town’s wide variety of tourism highlights.